Clean Carfax and all the equipment. It boasts an opulent interior with soft-touch materials, comfortable seating for up to seven, and one of the highest cargo capacities in the class. The base GMC Acadia seats eight in three rows. Front-row seats are spacious and comfortable. The second row comes standard with a bench seat, which slides forward to improve cargo space and back to increase legroom. However, the bench seat isn’t particularly comfortable. If you regularly haul passengers, the captain's chairs are more comfortable and better for third-row access. The third row can fit three children or two adults, and you may hear some complaints from adults on anything longer than a short ride. There is a full set of LATCH car-seat connectors in the outboard second-rows seats; the third-row middle seat has a tether-only connection. The 2013 Acadia boasts an impressive 116.1 cubic feet of cargo space. The interior looks good, with soft-touch materials lining frequently touched areas. However, when it was new, some reviewers noted that materials quality fell short for a vehicle with its asking price – especially Denali models. The most common complaint was the number of plastic surfaces in the cabin. The infotainment system features a new-for-2013 6.5-inch touch screen as standard. It’s surrounded by dedicated buttons for features like navigation and music. But because you can’t feel them, they’re hard to use when driving. The available Intellilink system adds Bluetooth and audio streaming, among other features. 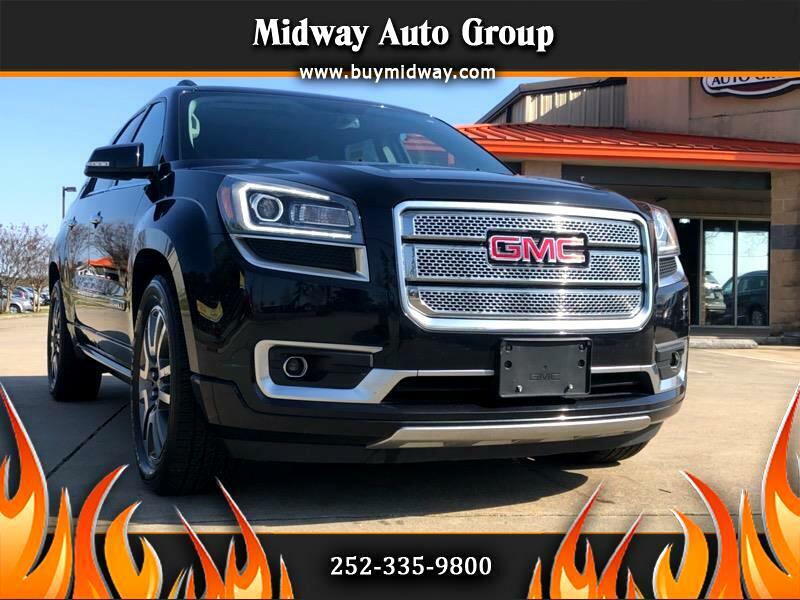 The average cost of a used 2013 GMC Acadia SLE base model with front-wheel drive is about $17,200. An Acadia Denali with navigation and all-wheel drive costs about $25,200. However, pricing may differ depending on the SUV's location, condition, mileage, and equipment. The GMC Acadia has one of the highest safety scores among midsize SUVs. The Insurance Institute for Highway Safety named the 2013 Acadia a Top Safety Pick. The IIHS also gave the Acadia the top rating of Good in all four crash tests. The National Highway Traffic Safety Administration gave the 2013 Acadia five (out of five) stars overall and the same score in frontal and side crash tests. It earned four stars in the rollover evaluation. The Acadia comes standard with a rearview camera and rear parking sensors. Upper trims are available with side blind zone alert and rear cross traffic alert. * While every reasonable effort is made to ensure the accuracy of this information, we are not responsible for any errors or omissions contained on these pages. Please verify any information in question with Midway Auto Group. Online pricing does not include taxes, tag and title fees and $499 Dealer Processing extra. *We are closed the first Saturday of the month. Message: Thought you might be interested in this 2013 GMC Acadia. Since the first day our General Manager arrived here in October 0f 2014, we have done things differently here at Midway Auto Group. All of our cars have the year, price, mileage and options marked on the vehicle. This allows you to drive through the lot and compare vehicles without having to go inside the dealership and ask for information. This one was Chris's cornerstone from the start. Everyone loves saving money, so he decided that we could sell more cars for less money and everyone would be happy! When we sell 10X more cars than the average dealership, that allows us to make less money per car and pass the savings on to the customer. Everybody wins! Since we don't sell brand new vehicles, we have the luxury of selling all makes and models. This gives you a better selection of cars than at any other dealership and keeps you from having to drive to 3 or 4 different places to test drive cars. We can carry everything from a Toyota Prius to a Ford F-350 Super Duty, as well as luxury cars from Mercedes-Benz, BMW, Audi or Lexus and economy cars from Hyundai, Nissan, Honda, or Chevy. No other dealership can compete with our diverse lineup of cars.